Creating an enabling environment where the poor and underprivileged can ensure sustainable livelihood with dignity. To improve the economic and social status of the poor and underprivileged rural and urban people through institution building and livelihood enhancement. RGVN aims at a sustainable livelihood of the rural poor where women are given priority. 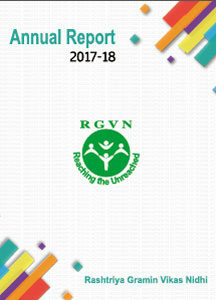 To make this process more effective and sustainable, RGVN delivers financial and non- financial support by nurturing and strengthening the grassroots level initiatives of NGOs and community owned institutions. RGVN acknowledges the traditional wisdom of communities, and upgrades it through scientific and modern technological interventions through a participatory process. Women is the vehicle for many such interventions, as they remain outside the realm of development and are the most marginalized in many communities. Programmes are based on sustainable practices, both of the activity undertaken and the environment. At the end of each programme, communities have greater control and management over their resources and feel empowered enough to “demand” from the mainstream what is actually their due.